I never thought I’d be the girl who walked around with antacids in her purse… but here we are. I’m in my 9th month of pregnancy and food just isn’t playing nice with the rest of my body anymore. I caved while at Target a few days ago. 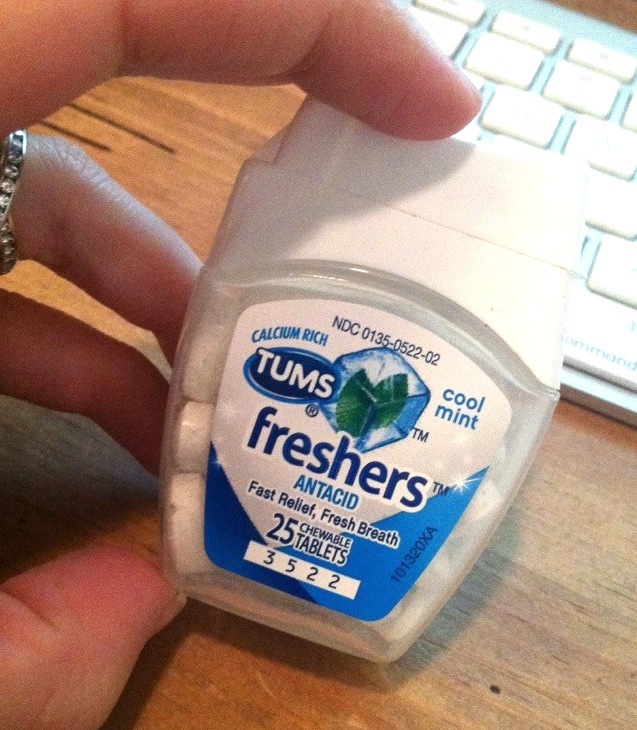 Bought a big bottle of Tums for my house and then bought this mini-container for my purse. I have to tell you – I’m seeing results. I don’t usually write about medicine – but this one has been a lifesaver the last few days and it deserves space on LATB. Pregnant or not — throw these puppies in your bag. You will thank me later (after chicken wings and french fries). Tums were a lifesaver for me when I was pregnant last year. Everyone said that because my heartburn was so bad, it meant that my daughter would have hair when she was born and boy were they right! Her hair is almost long enough for pigtails and she is almost 3 months now!I had really bad heartburn for the last 3 months of my pregnancy.